Event-goers enjoy catching up at the Boone Chamber’s After Hours event at La Quinta on Thursday night. 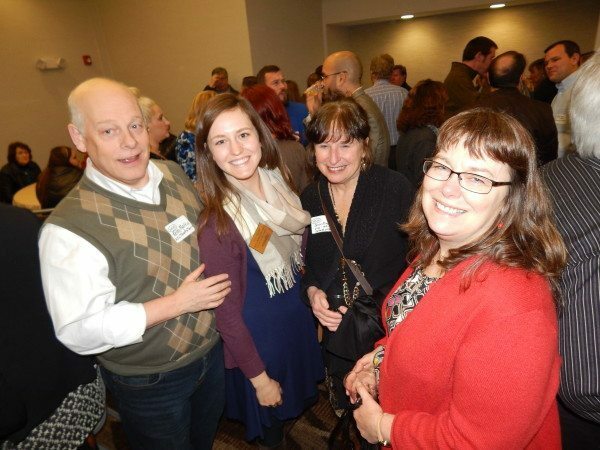 Friends and neighbors came together on Thursday night for the first Business After Hours event of 2016 with the Boone Area Chamber of Commerce, which recognized at the event the recipients of its prestigious Business of the Year Awards. La Quinta Inn and Suites and owners Justin and Selina Patel played host to the event, which saw a crowd of nearly 250 local entrepreneurs and community leaders. The hotel showed off its recently remodeled property and co-hosted the event with Carolina West Wireless. Event-goers enjoyed classic southern dishes and a dessert bar catered by Gadabouts, along with craft beer provided by BooneShine Brewing and wines from The Country Vintner. Country artist C.J. Ballard performed as guests caught up and got to know each other. Michael Maybee and board members accept the Business of the Year Award from the Boone Chamber on behalf of Watauga Opportunities on Thursday night. During the fun, the chamber presented its coveted Business of the Year Award to Watauga Opportunities, Inc. — a locally based manufacturing company and nonprofit community rehabilitation program. WOI is celebrating its 40th anniversary this year. It generates 45-50 percent of its budget independently, reducing its government subsidies by $2.5 million. It’s provided more than $1.34 million in wages over the last decade and has secured more than 1,000 job placements. Ray Russell of Ray’s Weather receives the Small Business of the Year Award at Thursday’s After Hours event at La Quinta. Photo by Ken Ketchie. The chamber’s Small Business of the Year recognition was awarded to Ray’s Weather, the High Country’s go-to resource for forecasts and all things weather in multiple counties. Although the chamber kept it all a secret from the recipients until the awards were distributed, Ray’s Weather founder and forecaster Ray Russell knew that something was up. Pleasantly surprised by the recognition, Russell said the award is a not a personal achievement but a testament to the company and its employees. Now in its 15th year of an incorporated business, Ray’s Weather began as a hobby when Russell, a professor at ASU’s Computer Science Department, first developed an interest in forecasting. In addition to helpful daily weather forecasts that are specific to each community in the High Country, Ray’s Weather also operates 85 weather stations and 40 webcams in western North Carolina, southwest Virginia and northeast Tennessee. Its expanded coverage area now includes Waynesboro, Virginia and Cherokee, North Carolina, spanning the entire stretch of the Blue Ridge Parkway. The Ray’s Weather team boasts Russell as forecaster and four additional meteorologists, as well as an office manager, a sales leader, a system administrator and a programmer. Want to know more or get involved? Visit the chamber online or call 828-264-6644.